The renin-angiotensin system (RAS) exerts a wide range of effects on cardiovascular homeostasis and blood pressure (BP) control. A large body of clinical evidence has demonstrated that inhibition of angiotensin II (Ang II, Aspl-Phe8) production by angiotensin-converting enzyme (ACE) inhibitors reduce the onset and/or progression of renal (1, 2, 3, 4, 5, 6, 7), retinal (8,9), and cardiovascular (5,9, 10, 11, 12) complications of diabetes mellitus (DM). 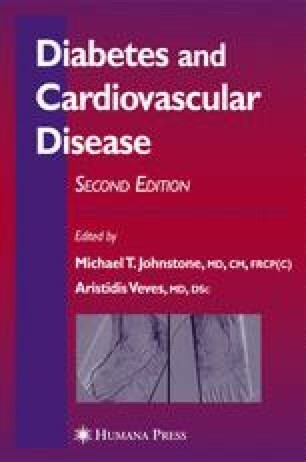 The majority of the BP-lowering effects and in vivo vascular effects of ACE inhibitors have been reproduced with angiotensin AT1 receptor antagonists (13, 14, 15, 16, 17, 18), suggesting that the Ang II/AT1 receptor pathway mediates most of angiotensin’s adverse cardiovascular effects in diabetes. Although inhibition of the RAS provides protective effects against both the microvascular and cardiovascular complications of DM, the actions and regulation of the RAS in diabetes remain incompletely understood. This chapter will review the interactions between the RAS and diabetes that have been associated with insulin resistance and cardiovascular disease (CVD).